Situated on the Brisbane River, just 30 min from the Brisbane CBD and 10 min from the Ipswich CBD, what more could you ask for on your special day. Karana Downs Country Club caters for all styles of weddings, from 25 for a more intimate gathering to 250 for the larger affairs. You can even hold your ceremony on site. So why not let our experienced and professional team ensure that your special day is carefully tailored to suit your every need. 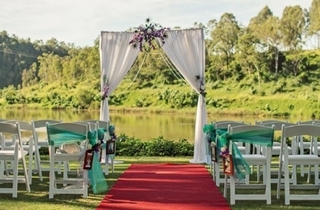 Situated on the Brisbane River, just 30 min from the Brisbane CBD and 15 min from the Ipswich CBD, what more could you ask for on your special day. Imagine the great atmosphere when the afternoon sun sneaks through the mature gum trees as you exchange your vows with the gentle sounds of the wind and ducks frolicking in the water. This is just another one of those beautiful sounds of the natural surrounds. Our beautifully manicured golf greens and fairways, majestic trees and blooming garden beds offer a beautiful backdrop to many stunning photo opportunities. Take the stress out of the day and let the friendly and vibrant team at Karana Downs Country Club tailor your special day to suit you. We will provide special attention and professionalism while delivering that fairytale wedding that you have always dreamed of and will treasure forever. As you embark on this special day, you can rest assure that our team will assist you in delivering that unique and truly memorable experience. At Karana Downs Country Club we want this special moment to be stress free, convinent and personalised to suit you and your guests. We cater for all styles of weddings, from 25 for a more intimate gathering to 250 for the larger affairs.